We all have those family recipes that are passed down through the generations. The ones that we make time and time again, not only because they are delicious but because you know that they are a sure-fire hit with everyone. The thing with family recipes that they are fantastic to make and consume, however, they do tend to stay within families. Why shouldn’t we be showcasing them to a wider audience to allow everyone the opportunity to enjoy your amazing winter warming soup, your no-fuss cheesecake recipe or how to get the perfect roast potatoes every time? In order to help us start sharing our family recipes and in turn increase our own go to recipe repertoire. 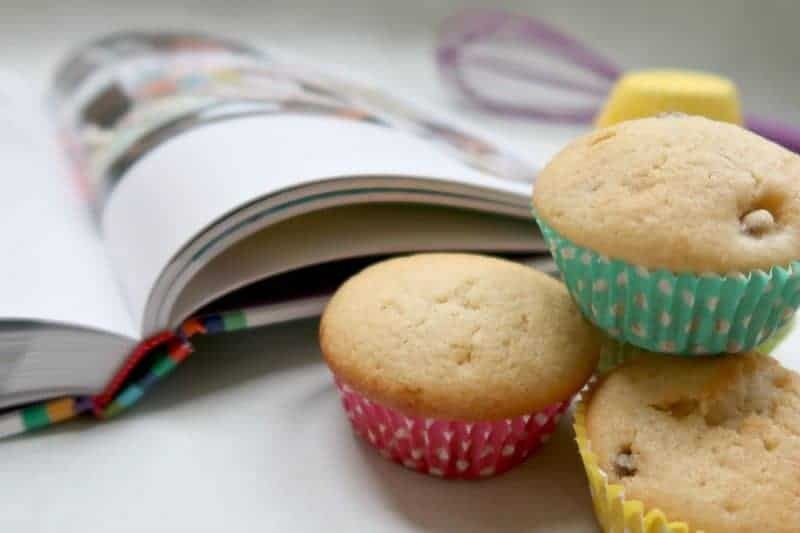 Mumsnet has been asking mumsnetters to see what recipes they love, which ones have been passed down the family tree and which ones they think that everyone should make. From this the Top Bananas! The best ever family recipes from Mumsnet book was created. The family recipe book from Mumsnet features 120 recipes from mumsnetters. Covering a whole spectrum of dishes from breakfast, packed lunches, Sunday lunch through to cooking with children and baking. Each of the 12 sections included in the book features 10 mouthwatering recipes suggestions for you to try. The difficulty being which one to make first. Whilst I would love to say that we opted to try out one of the slow cooking recipes in order to save my slow cooker from only being used for pulled pork. Or maybe a delicious warming soup for lunch on these cold blustery days… Sorry but no, I flicked passed these recipes and headed to cooking with children and the baking treats. It’s a bit of a running joke between Mr Boo and I that I can’t cook but I can make you a cake or biscuit. After spending my childhood in the kitchen with either my Mam or my Granny I can whip you up a batch of krispy treat cake but just don’t ask me to prepare a full on roast dinner. Although I would like to think my cooking talents have improved over the years, my heart still does prefer the baking side of things. When it comes to baking with the children I am always on the lookout for ways in which they can really get involved. Whilst they can stir a mixture etc. it’s not necessarily getting them truly involved with the process. The one-pot fruity buns recipe included in the Top Bananas! recipe book was perfect and something that Roo and Tigger could complete between them whilst I tended to the Nutella fudge on the hob. The recipe utilises the small pot that the natural yoghurt comes in to measure out the other ingredients required for the recipe. Making it perfect for getting the kids used to measuring out ingredients and following a simple recipe method. Makes 24 average size buns or 12 mammoth buns! Pour the natural yoghurt into a bowl. Rinse and dry the pot and use it to measure the caster sugar, flour and oil (in that order) into the bowl. Add the eggs and mix everything together until you have a light batter, then add the sultanas and lemon zest. Stirring the mixture once again. Spoon the batter into the cake cases and bake for 15 minutes until gold brown. Let the cool on a wire rack before munching as an afternoon treat or added to a picnic. Top Bananas! The best ever family recipes from Mumsnet // Where to buy? The Top Bananas! The best ever family recipes from Mumsnet book is available to buy from Amazon in either hardback or Kindle edition. To help you extend your recipe repertoire, we are lucky enough to have an additional copy of the Top Bananas! 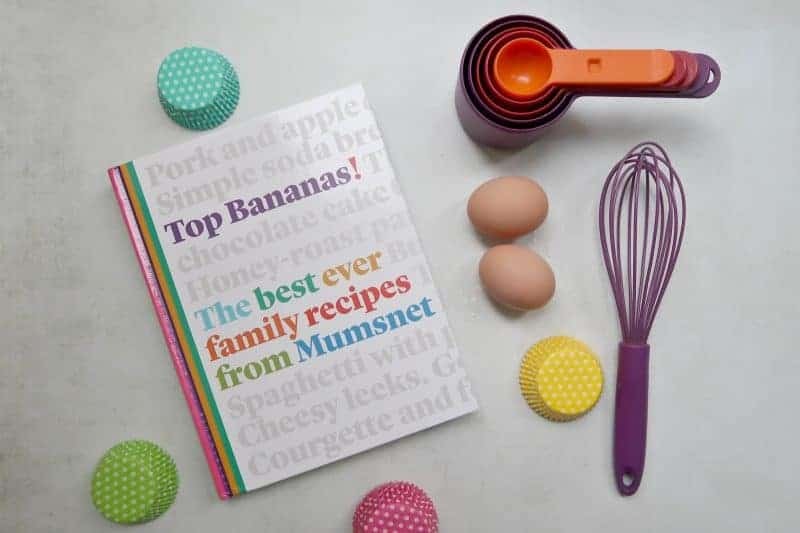 The best ever family recipes from Mumsnet book to giveaway. Chicken stew – my mam used to make it when I was little and I make it all the time for me and the kids, especially during the Autumn and Winter. It is quick to prepare and cook and warming and nutritious too! We make a lot of breakfast sundaes as a family. We make cupcakes as these were easy for my kids to make when they were little. Parmesan Crusted Chicken. The chicken is packed with flavour, and it’s seared quickly to keep the juices inside. Serve with vegetables and rice/potatoes and you’re all set for dinner. My mum’s cottage pie with baked beans! It’s a mild, fruity chicken curry dish, nothing authentic about it at all but it’s easy and delicious and the whole family love it. My partner has the best lunch dish ever, chicken, prosciutto and madeira wine………….on toast! to be honest its Tatty Ash and thats because i am a single mum off 3 going to be 4 soon as adopting a baby but i am the most rubbish cook you have every seen!! and i honestly think the kids are beginning to dislike tatty ash as they have it so much!! Rissoles (its an Australian dish) similar to meat balls but 100% better! Infact I’m now going to make them this week! My late grandmother’s South African recipe of a cross between a spaghetti pie/shepherds pie. Absolutely delicious and comforting. I love cooking Katsu curry, the kids love it too. Scotch pancakes. Pizza and spag bol are great too as my little one helps then. These three are his favourites. Cottage Pie is our favourite. I make Lasagne quite a lot! Pulled pork, I cook it in the slow cooker and it does it’s thing while I work and makes the house smell amazing so bonus. Me and my little boy love making banana bread together. The one meal I can always guarantee will mean clean plates from everyone in the family is when I make my Mexican 5-Bean Veggie Chilli with Rice and tortillas. Macaroni Cheese, as a filling, warming and comforting meal :- Especially in the Winter, and delicious served with a nice crisp, healthy salad. Our family have always used Scottish Cheddar Cheese for the addition to white sauce (home made). Gives a distinctive, delicious flavour.